RESPECT [ree-spekt] noun Showing others they are important by what you say and do. Right now in UpStreet we deep in the topic of respect. As we learn more about who God is and what He does, respect becomes a natural response to God’s character. But not only does God have all authority, according to the Bible, He also sets up governing authorities on earth. So showing respect to those in authority over us is an extension of showing respect to God. This month’s memory verse is a quick and easy reminder of exactly that: “Show proper respect to everyone.” (1 Peter 2:17a, NIV) Proper respect acknowledges what is appropriate given the situation and position of the person. The person in authority over us was made by, is loved, and was placed in authority by God. We show them respect with our speech, actions, and attitude. But what if we disagree with our authority? Sometimes respect means we won’t get our way or that our idea won’t win out. It might mean swallowing our pride in a very humbling moment. Or choosing our words very carefully when it would be easier to lash out or say something hurtful or defensive. When we stop and remember to respond with words and actions that show our authorities they are important, that they are made by God, and that God has given them their position, we show respect to our authority and to God. In Week One, the faith of the centurion (Matthew 8:5-13) helps us recognize God’s ultimate authority. The centurion is a man who knows respect and demands it from the soldiers under his command. Yet, he humbly respects Jesus’ authority even though he isn’t even a Jew. He understands who is really in charge. Our Bottom Line is: Respect God because He’s in charge of everything. In Week Two, we come to understand that God puts authorities in our lives to help protect and guide us, whether we agree with or even like them. Romans 13:1-5 teaches that God has established the governing authorities in our lives. When we respect them, we respect God. Our Bottom Line is: Respect God by respecting the people He’s put in charge. In Week Three, when David spares Saul’s life (1 Samuel 24), he demonstrates that often those in authority haven’t earned our respect. When we have the self-control to show respect with our actions and attitude, God is honored. But respect doesn’t mean letting someone hurt you or others. David was smart to run away and get help. The Bottom Line is: Respect those in authority, even if they don’t deserve it. In Week Four, we hear the contrast our words can create when we aren’t respectful (James 3:9-12). We’ll learn the importance of being consistently respectful with our speech. Respect or disrespect is obvious in our tone and the words we choose. In some cases, what we don’t say shows the most respect. So, our Bottom Line is: When you respect others with your words, you show respect to God. Respect is truly a question of how we respond to our authorities. Will we assume that everyone has something they can teach us? Or will we stubbornly work to get our own way? When we choose to elevate our attitude and think a little higher, we show others they are important because God has given them their authority. Heres a fun family activity for rainy days…like today! Respect is like mud pudding. You mix a little of all my favorites together and come up with something excellent. For mud pudding, you mix together chocolate pudding, Oreo cookie crumbles, and throw in some gummy worms. But for respect you mix some kind words, with thoughtful actions, and throw in a few smiley faces. Both take a combination of things in order to come out right but the end result is delicious!You know, I finished my triple cheesy bacon burger a few sentences ago and could really use an afternoon snack. I think I’ll go make some mud pudding. And hey, here’s the recipe in case any of you want to make it, too! Follow directions on the box to make pudding. Mix in Oreo cookies and gummy worms. Refrigerate. Enjoy! Eighty-eight percent. Maybe more. Maybe less. This is the percentage of kids estimated to abandon church entirely once they graduate from high-school. Not 88% of ALL kids mind you, since many kids are never introduced to church ever. No, this is 88% of kids who have grown up IN church. They heard God loved them. They heard Jesus died for them. They heard they all about Noah, David, Paul, John, and the rest of the cast of the Bible. They heard it all. They just don’t care. They are struggling to find relevance in the church, and questioning the necessity of any relationship with God. The world around them has a louder voice and the church is being pushed further and further away. Simply put….when church alone is expected to impact and transform a kids life, statistics show nearly total failure. So what do we do? We change our thinking..and our strategy. 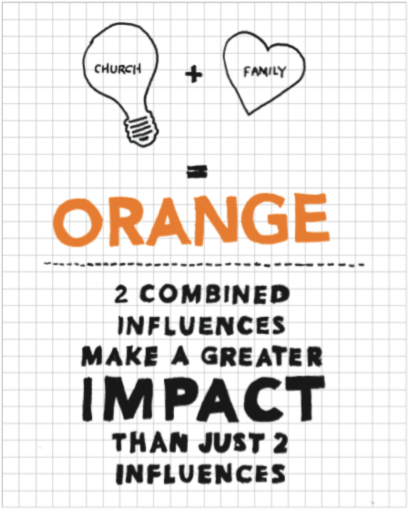 If we can visualize the family as the warm, loving, accepting part of the equation represented by the color RED….and Jesus Christ, the light of the whole world represented by the color YELLOW…then the intersection of these two separate, yet equally important parts, yields ORANGE ministry. If a child attends church twice a week, every week, for an entire year, the church will will have around 110 hours of quality time invested in that child’s life. During that same period of time, parents will be afforded over 3000 hours! The question is not whether church or parents have more influence; parents win hands down. The question is how will the church partner with parents and equip them to lead their child into a growing relationship with Jesus. We believe what happens at home is far more important than what happens at church. Therefore structuring ministry in a way that never competes for time, and always supports the parents first, allows for a deeper and more authentic family ministry opportunity. At the same time, when parents assume roles within family ministry (small group leaders, worship leaders, storytellers etc) it gives them confidence and knowledge to connect and invest spiritually with their own kids in ways they never thought possible. Combining the efforts of the family and the church yields greater results than both parties working on their own. In the past ministries shut out the parents. Basically children and student ministry was treated like dry cleaning…drop off your kid, go get “fed” in big church, pick up your kid, hope they learned something. If not, its okay; so long as your kids number never shows on the screens and interrupts the service everything’s good! Parents were just as guilty. Drop’ em off and run! Sunday school lady will teach them all they need to know. But if she doesn’t, its okay; so long as your kids number never shows on the screens and interrupts the service everything’s good! 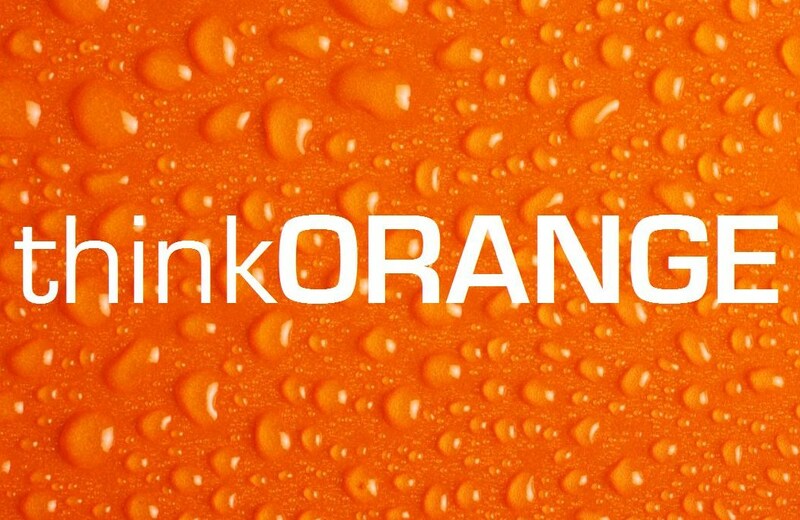 ORANGE thinking is a dramatic shift away from “What can you do for me?” and replaces it with “What can we do together?”. “100 years from now, the only thing that will matter is a child’s relationship with Jesus Christ”-Reggie Joiner, founder ReThink Group. If we believe this….if we truly believe that nothing on earth is more important than a child’s relationship with Jesus, then we have no option but to shift our entire mentality away from a failed, outdated mode of reaching kid. 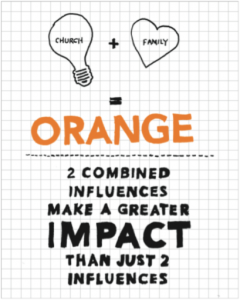 ORANGE is about integrating two great influences: the church and the family. Divide and conquer only works in war games but this isn’t war. It’s life. It’s love. Summertime…sweet, wonderful summertime. Some things immediately come to mind when you hear that word….ice cream, swimming, cookouts, baseball etc., the list goes on and on. If you go to church regularly, chance’s are your list will eventually include a standard staple of summer church programming…Vacation Bible School. Unless you started going to church after high school, chances are good you’ve attended VBS somewhere. Either your own church held one (if you attended church), or your parents dropped you off at one close to your home. (Or more than one, ’cause it was 5 hours of parental freedom!) You probably still have fond memories of those 4 or 5 days a year even now. Well, guess what….I loved Bible school. I admit it…I enjoyed the music and the crafts and the hangin’ out with my friends. I liked the fact that, for at least a week, learning about Jesus was, well, fun! I wouldn’t tell you that then, of course, cause all my cool points would fly out the window. But I really did enjoy it. I grew up Methodist and for a long time I just thought VBS was a Methodist deal, like reciting the Doxology every Sunday. It wasn’t until I was older, and driving I’m sure, that I began to realize that within a mile or two of my house there was about 6 vacation Bible schools being advertised. They were scheduled at different times…some at night, some in the morning, and almost all were on different weeks of the summer. Oh, and they weren’t just Methodist. Now, drive around today and the numbers of VBS’s are amazing. If kids want to go to VBS, or parents want their kids to atttend VBS, there is no limit to the choices. “Hit The Trail”, “WipeOut”, “Surfin’ Safari”…the themes are varied as the churches themselves. And kids still love them…including mine. My two oldest kids will attend at least 2 different VBS events this summer. They start with my mother-in-laws church, which they are are doing right now, then move on to my parents church later next month. Again, they love it. So, now for the million dollar question. If I loved them…and my kids love them…and most adults have such wonderful memories of them…and kids often get saved at them…then WHY IN THE WORLD DOESN”T MOUNTAIN GROVE DO THEM??? Well, quite simply, it doesn’t fit, and honestly, not necessary. The history of Bible schools goes back to 1860, but the “modern-day” version traces to 1898 when a church leader in New York launched the idea as a way to keep poor and homeless kids off the streets for a little while each day while public schools were out. From there it grew into the version we have today….setting aside one week each year to focus entirely on kids. Little by little a common layout emerged for VBS…kid specific music for worship, and small groups of focused lesson/activities that tie into a large group lesson that attempts to show kids how 2000 year old scriptures are relevant in their lives today. Wait…what? That sounds very familiar?? About 3 years ago, Mountain Grove set out to change the thinking about kids and church. Instead of doing the minimal on Sunday to reach the hearts of kids, we would go overboard! We would turn Sunday mornings into events! We wanted church to be as exciting as any party the kids might attend the rest of the week. Ultimately UpStreet, was born out of this desire, and the choice to utilize a curriculum that maximized that thinking. Instead of 5 days of focused effort on kids….we chose to focus that effort 52 days a year. Or 10x the number of Bible schools. If you aren’t familiar with the curriculum’s we use..click here and explore 252 Basics.Every Sunday in UpStreet, our kids experience; kid specific music for worship, small groups of focused lesson/activities that tie into a large group lesson that attempts to show kids how 2000 year old scriptures are relevant in their lives today. The exact formula of virtually every Bible school program. Since so many VBS events will take place elsewhere, we have chosen to abstain. Am I, or Mountain Grove, against vacation Bible school? Of course not. Am I bothered by that? No. Am I embarrassed that “a church our size” doesn’t offer VBS? Absolutely not. But for the purposes that we are focused, and with our current limited resources (fiscal and physical) vacation Bible school is not a priority. As the children’s pastor I welcome any and all questions or comments anyone may have on this (or any) topic you may have. I can be reached through the church office, or through email upstreetkids@gmail.com or find me in UpStreet any Sunday morning.